"Chinatown Wars shows there are no limits to what can be done right on a handheld with a little creativity. " The war spills over onto a new patch: the Nintendo DS. 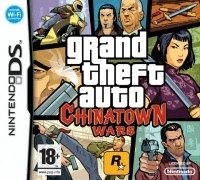 The long-running Grand Theft Auto franchise debuts on the DS with Grand Theft Auto: Chinatown Wars. 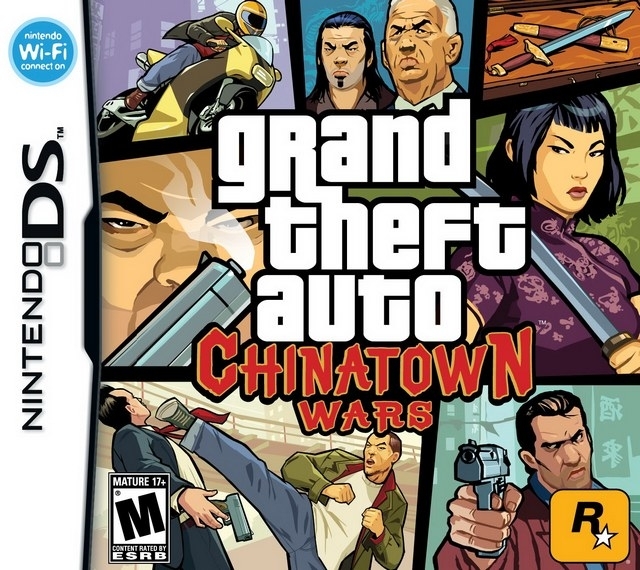 A new entry into the Grand Theft Auto series and a Nintendo DS exclusive, Grand Theft Auto: Chinatown Wars was built from the ground up for Nintendo DS. It’s the story of Huang Lee, a spoilt, wealthy member of the Chinese Triad crime syndicate. 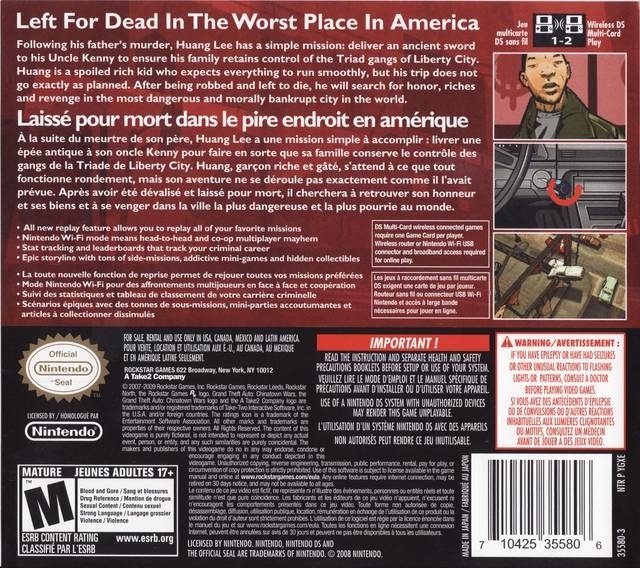 Huang arrives in Liberty City after the untimely assassination of his father in Hong Kong to deliver the ‘Yu Jian’, a family heirloom, to his power-crazy uncle, Wu ‘Kenny’ Lee. The ‘Yu Jian’ is a sword that’s been a false symbol of honour, with its history and value draped in lies. But once Huang arrives, he’s ambushed by a car full of gunmen - shot, robbed and left for dead, dumped into the Humboldt River. He barely survives, but the ‘Yu Jian’ is stolen. Huang must retrieve the sword for his uncle and take down those who wanted him to sleep with the fishes. This is a full-fledged Grand Theft Auto experience. As Huang, you’ll explore a massive, modern iteration of Liberty City. 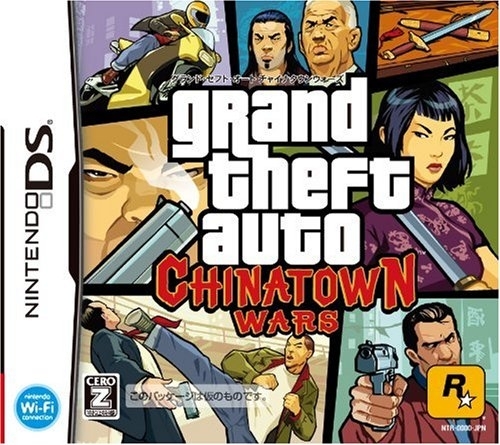 The world of Chinatown Wars is among the biggest, richest and most detailed gaming environments on Nintendo DS. The 3D city is shown from an overhead, angled perspective using a camera that rotates 360 degrees. As they move through the city. the player can see each and every side of all the cars and buildings, giving the environment more of an isometric feel. In Liberty City, you’ll find a large assortment of vehicles such as cars, trucks, vans, buses, boats and motorcycles. When you drive some of the vehicles, you can perform special side-missions, such as taxi missions, fire-fighter missions, paramedic missions, vigilante missions, and food delivery missions. To learn about the newest missions and more, Huang has a handy PDA, the main hub of communication and access to game menus. On his PDA, Huang receives emails and messages from characters as well as special offers from online retailers like Ammunation that can deliver the finest custom-ordered guns and ammunition straight to his home. The PDA can also serve as a music player, a contacts database and a resource for all current trade information surrounding the in-game economy. The PDA is also equipped with a full-featured GPS map. Seen on the bottom screen of the DS when you’re driving or on foot, the GPS map details key points of interest and mission objectives. Players can tap any intersection to set a course for the shortest legal route to any destination - which will change dynamically should the player veer off course. 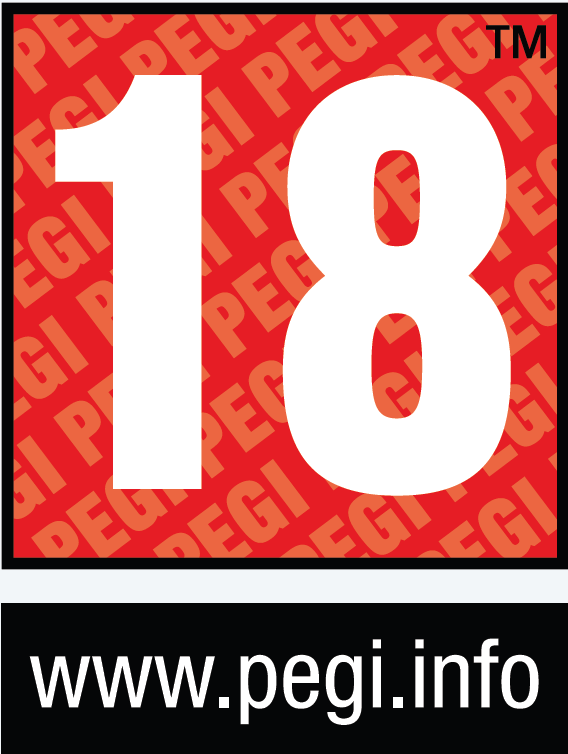 Other key points of interest, once you discover them, will also be added to the map, such as Pay N Sprays, Gas Stations, Safehouses, Odd Jobs, Random Encounters, Rampages, Street Races, Unique Stunt Jumps and more. The police are friends to most citizens. Unfortunately for Huang, he’s unique. However, your demolition skills can get Huang out of hot water. The Chinatown Wars police-evasion system delivers a fun and frantic arcade-like action experience because instead of evading different levels of police radar on the map, players are now smashing, crashing and ramming cruisers at full speed to disable them. The more cars the player disables, the lower Huang’s Wanted level falls. The objective, however, isn’t to completely destroy the police vehicles because if the player harms the policemen inside, the Wanted level will only increase as a result. What would a Nintendo DS game be without cool Touch Screen controls? 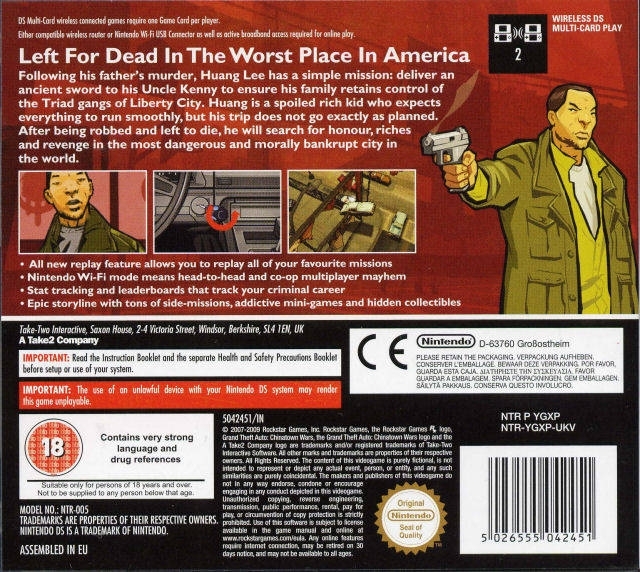 Grand Theft Auto: Chinatown Wars is no different. You’ll use the Touch Screen for such activities as bursting out of submerged vehicles, hotwiring cars, preparing Molotov cocktails at the gas station, digging through trash bins for hidden weapons and tattooing. Grand Theft Auto: Chinatown Wars is not for the kids, as the subject matter is for mature audiences. But for those old enough to get their hands on the game, this is a DS title that raises the bar in terms of both style and substance. 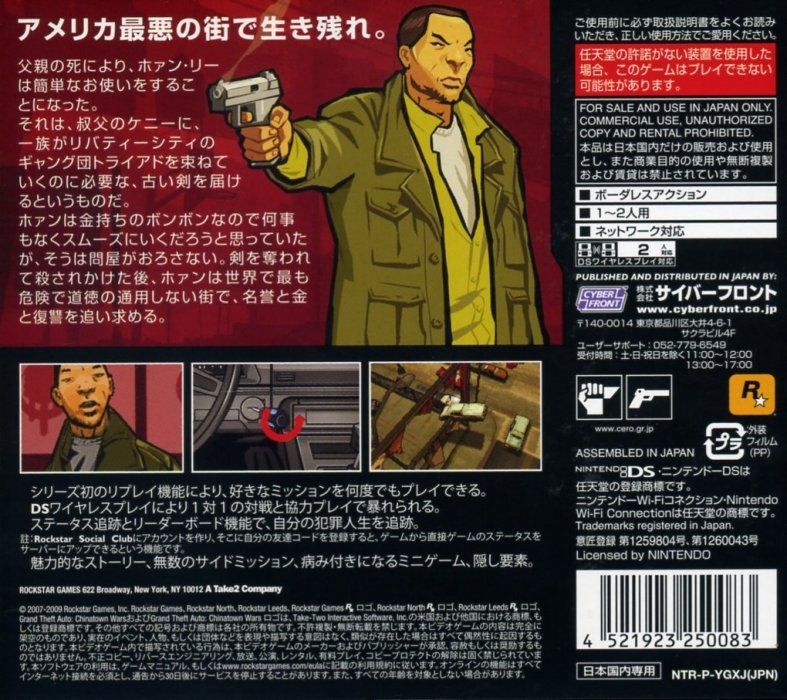 Grand Theft Auto: Chinatown Wars also utilises Nintendo Wi-Fi Connection. Players can upload game stats, send messages to friends and exchange items. 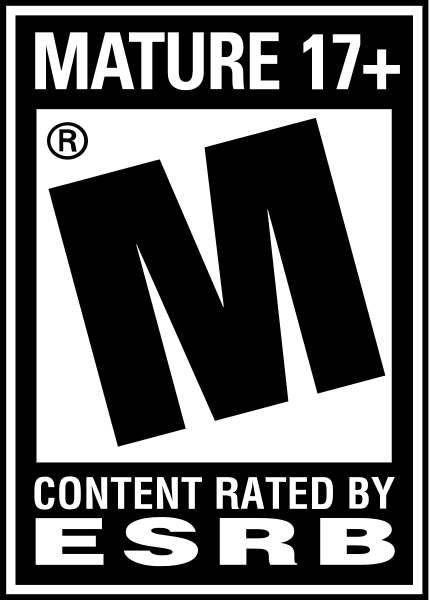 Further details about the game’s Wi-Fi capabilities and multiplayer modes will be announced soon. Experience changing weather effects and a 24-hour day/night cycle. Pedestrians feature advanced A.I. that allows them to head out of the doors of their homes, about town in their cars and back home again. Some may stop to talk to each other, get into arguments, walk in and out of shops, use food stands and more. 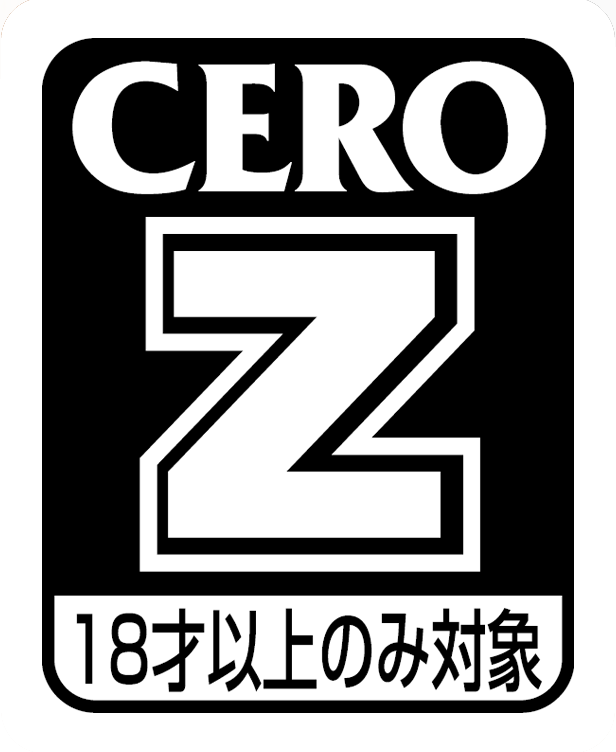 great game, believe me or not, but I enjoyed this one more than GTA IV, which was boring to me..
People are saying the PSP version sold better because the PSN was not counted. Come on Rockstar add this to the 3DS download today. It's a great game, sales deserved!